The fingers and thumb are able to bend and straighten because of tendons and muscles in the hands and arms. A tendon usually moves smoothly through the sheath (tissue) that covers it. However, when a finger's flexor tendon becomes inflamed, it may not be able to move smoothly through the sheath so that, when an attempt is made to bend or release the finger, the pulling of the enlarged tendon through the sheath results in the tendon's catching or locking. The medical term for trigger finger is "stenosing flexor tenosynovitis." Applying ice, stretching and taking nonsteroidal anti-inflammatory medications are recommended treatments for trigger finger. However, the quickest and most effective treatment is a cortisone injection into the affected tendon's sheath. If the trigger finger does not go away after two injections, and is not helped by ice, stretching or anti-inflammatories, surgery may be recommended. 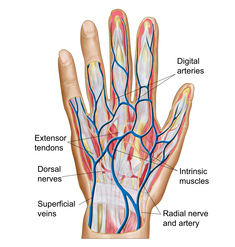 During surgery for trigger finger, the tendon sheath is released, and/or inflamed or scarred tissue is removed. Surgery usually permanently cures trigger finger.